Most art lovers who visit New York City make it a point to visit The Metropolitan Museum of Art on the Upper East Side of Manhattan. But many of them miss the museum's marvelous collection of medieval European art located in Washington Heights known as "The Cloisters". Modeled after and featuring architectural elements from medieval Europe, The Cloisters are a truly wondrous place to visit, particularly in the spring and summer months when the gardens and surrounding Fort Tyron Park are in full bloom and beauty. Getting to The Cloisters is not hard, and it can make for a lovely break from the noisy, crowded and busy streets of most of New York City. Plan to spend a morning or afternoon here...or perhaps even longer if you like. Read on to learn more about The Cloisters' history, collections, and important visitor information. All photographs on this page are by the author, sockii. Much of the collection at The Cloisters museum came from the collection of one George Grey Barnard, an American sculptor who also collected and dealt in medieval antiques art. In 1914 he established the original Cloisters museum in Fort Washington to showcase his work. That collection - and museum - was acquired by the Metropolitan Museum of Art in 1925 thanks to a generous donation by John D. Rockefeller, Jr. Rockefeller already had some important works of medieval art including the Unicorn Tapestries (or "The Hunt of the Unicorn"), and it was clear that more space, and a new museum, would need to be built to properly showcase it all. Rockefeller purchased over 60 acres of land north of Barnard's original museum with the intent of turning it into a public park and building the new space for the collection. He even purchased and donated land across the river in the New Jersey Palisades, in order to preserve the museum's dramatic view. To build the museum, architect Charles Collens was employed to recreate the feeling of an authentic European medieval building. Elements of five French cloistered abbeys were actually transported across the Atlantic and rebuilt brick-by-brick as part of this museum, merging these different medieval styles and architectures into one construction. The Cloister grounds also feature herb gardens and grounds inspired by medieval manuscripts and artifacts, to attempt to authentically replicate the plants which would have been cultivated during those times. This new museum was open to the public on May 10, 1938. Currently the museum is home to over 5,000 works of medieval art, including paintings, tapestries, reliquaries, altarpieces and illustrated manuscripts. For lovers of art from the 12th through the 15th centuries, it is an impressive collection that showcases art and styles from countries including France, Germany, Italy and Spain. Even if you can't visit The Cloisters yourself, you can enjoy the museum's collection with this beautiful guide book. Over 200 pages, it spotlights The Cloisters' most important objects and artworks. Some of the architectural elements which were transported from France. Light and shadow play out in this courtyard in the Cloisters. When most people think of The Cloisters in NYC, they think of the famous "Unicorn Tapestries". A set of seven highly colorful and imaginative tapestries from around the beginning of the 1500s, these works of art have fascinated and enchanted all who have seen them for centuries. Learn more about them - and the religious symbolism contained within - in this official Metropolitan Museum publication. The Cloisters are open Tuesday - Sunday year round except for holidays. Check The Cloisters website for seasonal hours. The "recommended" admission price is currently $25 for adults, less for children and students. That admission will get you in to the Metropolitan Museum of Art on the same day as well - although you might find it quite a challenge to see both collections in one day. If you are a member of The Met, you can get in to the Cloisters for free. The easiest way to get to The Cloisters is by taking the A train (8th Avenue Express) to 190th Street. The express will get you from Times Square to The Cloisters in about 25 minutes. When you get off the subway, be sure to exit the station via the elevator - not the long corridor - as it is the exit closest to the museum. You will still have a bit of a walk, about 10 minutes, through Fort Tyron Park to get there and signage is not that clear. (Watch the video below which shows the pathway from the subway step by step.) There is also parking nearby in Fort Tyron Park if you choose to drive. Inside the museum, non-flash photography is allowed - but be sure to be careful about not touching or bumping in to these wonderful yet fragile items. There is a cafe on site where you can enjoy a light snack, otherwise food and drink is not permitted in the museum. First-time visitors to The Cloisters may find it difficult to figure out how to get there through Fort Tyron Park. This video will take you there - literally step by step - from the 190th Street subway station. 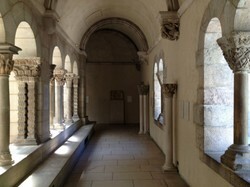 Then, please check out this wonderful video guide to The Cloisters presented by the Met Museum. It will certainly give you a taste for what you can see when you visit! Gardens of wildflowers and spring blooms provide a dazzling display of colors. Dramatic views across the Hudson River to the New Jersey Palisades. Through the trees, one can see the Cloisters in the distance. Double daffodils are just one variety of beautiful blooms in Fort Tyron Park. I've never been but have heard about the place. I don't quite understand what you say about Rockefeller. He donated his personal collection to the Met and "then" he donated it to the Met -- ? I love visiting The Cloisters. It is a challenge for a country bumpkin from Maine to navigate the public transportation. Your pictures are beautiful.